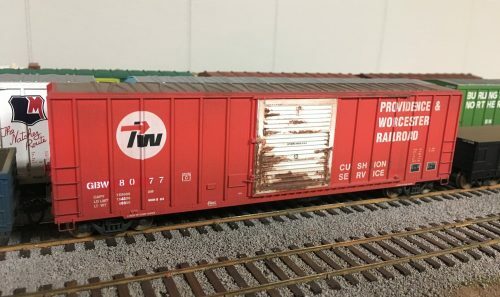 BR 50222 is an interesting woodpulp service boxcar with a storied history. The car was originally built for the Southern Railroad (SOU) by Pullman-Standard. The “waffle” pattern of the car sides accomodated load tie-down attachment points on the inside of the car. Southern acquired a large number of these “waffle-side” boxcars from Pullman-Standard, and this design would become a real signature car on that railway. Only a few other identical examples were built for some of the “Family Lines” railways which later became part of CSX. This particular car was sold by Southern to Helm Leasing (HLMX) and was reconditioned for woodpulp service with end reinforcement and carbody vents in the corners and then saw service on BC Rail as BCOL 850222. When BC Rail let the lease expire, they were renumbered BR and dropped the leading 8 from the car number. 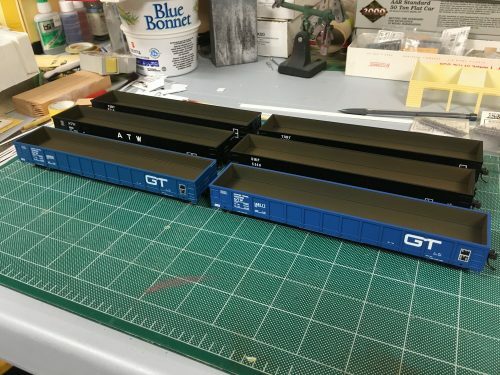 Currently these BR cars are commonly seen in woodpulp service for Canadian Pacific. At Hawk Junction, July 19, 2017. GROX 50008 is an example of the pulpwood flatcars commonly seen around log sidings on the former ACR currently. Most of the cars I saw were either these GROX cars or cars with VRSX reporting marks, which were even more commonly. Unfortunately I wasn’t able to get photos of any of the VRSX cars from the train.